So, the other day, I was making banana bread, which is kind of an old stand-by “I am making this SOLELY for the purpose of not having my kitchen smell like rotting food” project. I had my own recipe, but I apparently hadn’t had any coffee or meth or ATP that day so halfway through I realized I had been arbitrarily pulling ingredient quantities from like three different recipes. All of which made different numbers of loaves. A few minutes of winging it and about an hour of baking time later, I had the best damn banana bread I had ever tasted. And then I made it two more times and it was still the best. So… here you go. 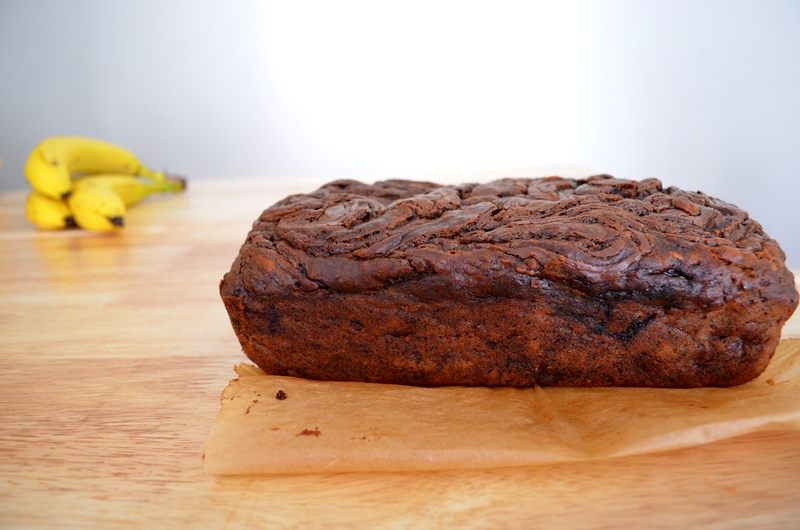 A loaf of personal-development banana bread. Here’s to having NO IDEA what you’re doing sometimes. Preheat oven to 350°F and line a loaf pan with parchment. In a large bowl, mash the bananas. Do it with your hands. It’s fun. Whisk in butter, eggs, and brown sugar. In a separate bowl, mix together baking soda, cinnamon, nutmeg, and flour. Add to wet mixture and mix until incorporated. Pour batter into prepared pan. Drop nutella on top of the batter and swirl with a knife to distribute it a little more evenly across the top and to marble it a little into the batter. Bake for about 1 hour, or until a tester inserted into the center comes out clean (or, only covered in nutella).